Jasmine tea is one of the very important teas in our lineup. Many people may think that Jasmine flower plays an important role in Jasmine tea. 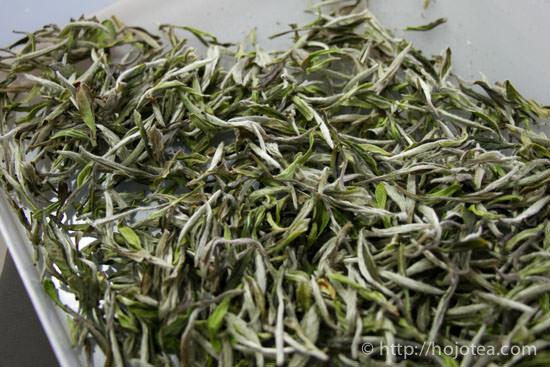 Nevertheless, the most important element in Jasmine tea is the base green tea. 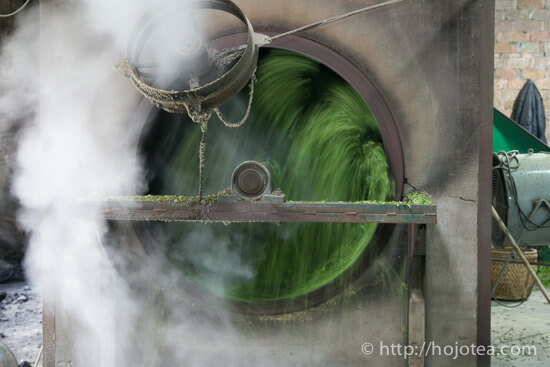 In this early spring, one of our very important objectives for visiting Fujian province is to look for the base-green tea for making jasmine pearl. Jasmine tea can be found in everywhere. 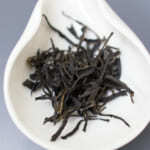 However, it is one of the most difficult teas to secure the procurement. There are a lot of stories to tell. 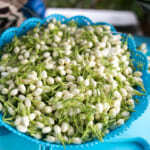 For sourcing Jasmine Pearl, we are not just buying the finished product of Jasmine Pearl. We have to buy green tea first in this season and keep it until summer. In the market, the jasmine pearl is also available for us to buy in August to September when jasmine flower is available. However, the finished product of Jasmine Pearl moves very fast due to the increasing demand in China domestic market. If I wait until summer, the choices are limited. In fact, I have ever failed to purchase jasmine pearl 4 years ago. 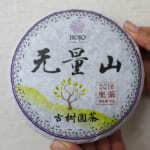 I need to secure the mao cha (crude green tea) now and store it until summer until jasmine flower season comes. The base-green tea for making jasmine pearl. This tea will be rolled in to a pearl shape. The base-green tea for jasmine pearl. 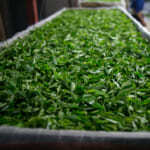 In fact, nearly 50% of teas produced in China are green teas. 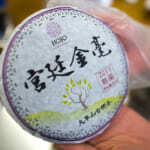 Unfortunately, very limited kinds of green teas are suitable for making jasmine pearl. Firstly, the tea should not have strong flavour. If the base green tea has a distinctive flavour, it distracts the flavour of jasmine flower. 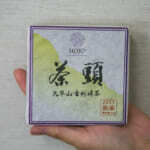 It is believed that most of Fujian green tea is suitable to process into jasmine tea. It is because that Fuding Da Bai Hao cultivar (福鼎大白毫種) gives less flavour and its gentle character is suitable for making jasmine pearl. 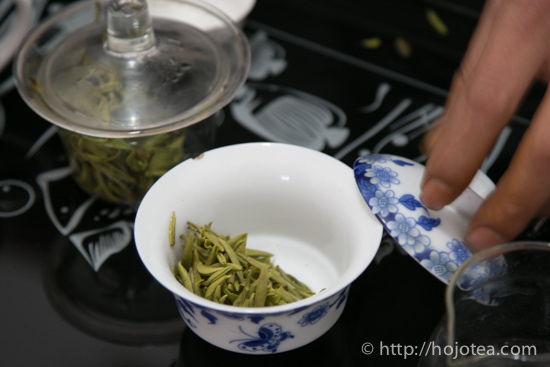 Secondly, the tea must have the right size of bud if it’s to be rolled into jasmine pearl.Besides, the Jasmine Pearl should be a little white, thus the bud should be covered with down. After all, Fuding Da Bai Hao meets all three criteria mentioned above and it’s the most sought after material in making Jasmine Pearl. However, buying the right base-green tea is getting more difficult. 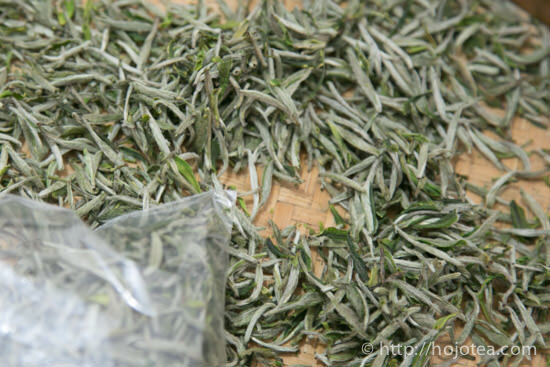 The Fuding Da Bai Hao cultivar is also used for making white tea such as Silver Needle and Bai Mu Dan. 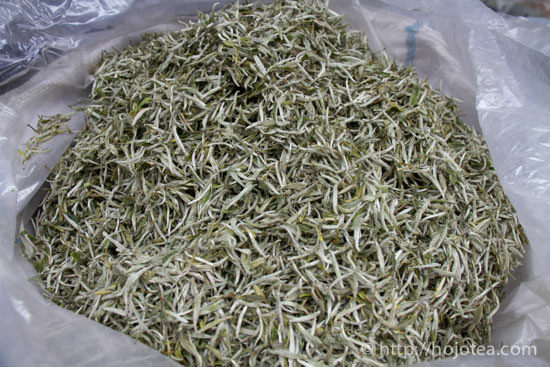 Since the price of white tea stays very high in a past few years, farmers switched their production to white tea and many of them refuse to process green tea. 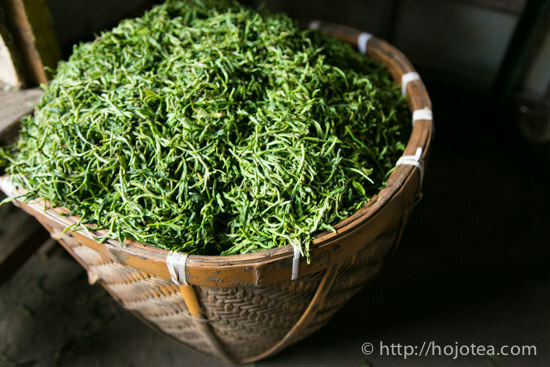 As a result, the price of green tea is also increasing. 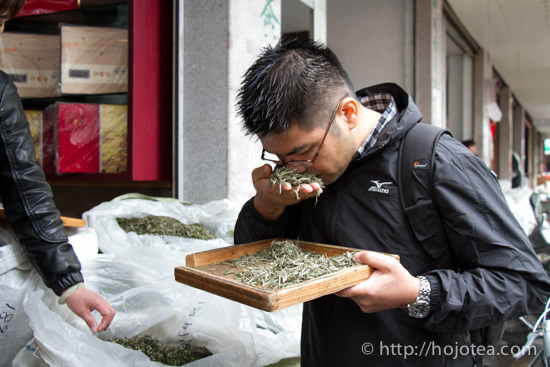 With Hojo’s standard, the green tea for jasmine pearl has to be the first-plucked tea in March. We also need to concern about the intensity of after taste and body. 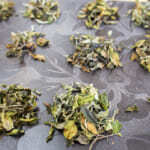 After we select the suitable batch of green tea, it will be then tested for pesticide residues before we can confirm the purchase of the particular batch. In a way, we cannot buy any tea in the tea market even if the quality and the price are suitable, unless they are willing to hold the green tea for two weeks until the pesticide testing result is confirmed. 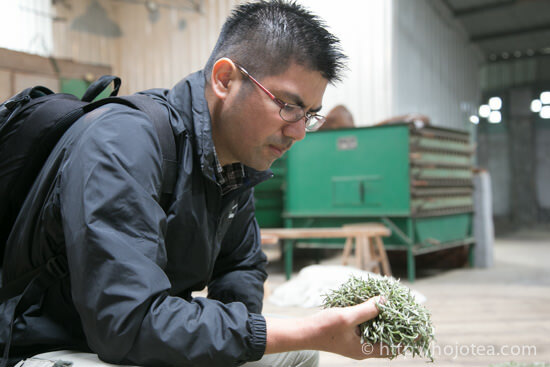 After spending some time checking the green tea with individual tea supplier, we came to the conclusion that it’s impossible to obtain the quality we are looking for from the commercial tea market. 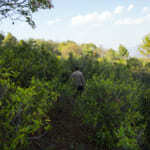 The way out is to obtain tea from contracted tea garden that quality and safety is up to our requirements. 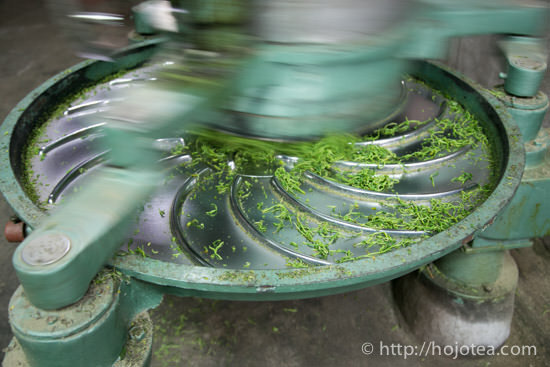 This is the rolling process for making green tea. 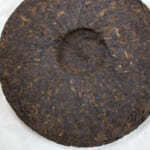 For high-end jasmine pearl, the tea leaf is never rolled.